Felt Shrunken Head, Halloween Monster Decoration, Mermaid, Troll, Mythical Creature Felt Art Doll . Felt Zombie Monster Halloween Brooch, Quirky Felt Brooch Pin With Monster Pheeples, Bite Me! Take your felted friends with you on adventures! I have been discovering the world of wool and felt since 2007 when my sister showed me some work that she'd been creating in her textile class. To be able to take the loose fibres of wool and matt them together in such a way as to create any solid form that you could imagine... This, I thought, was something special. I had being studying all sorts of creative, sculpting processes in my Craft Design course at The University College Falmouth, UK but needle felting was something that they didn't cover. 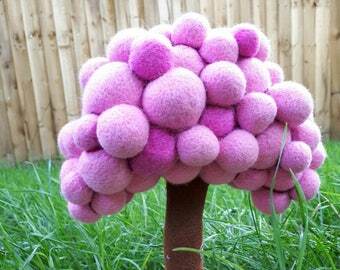 I couldn't leave it alone though, spending any time I had learning the skills and researching into the wonderful world of felting. By the end of my course I had created my entire exhibition from needle felted characters and was even more in love than before! My work here at Rebecca's Emporium is inspired mostly by the hustle and bustle of the world around me. Seeing so many monotone faces around me on my commutes each day motivates me to create as many little smiles as possible! I design my pieces to add a little fun into everyday life. For all of you out there who like something different, the adults that don't quite want to grow up. All of my pieces are bright, colourful and easy to have around. Easy to hang, wall art pieces and light weight jewellery that will brighten up the little moments of your day. 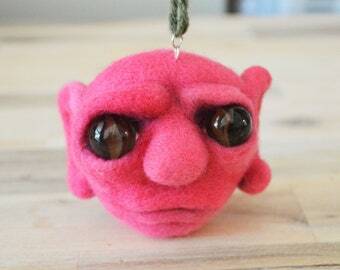 An obsessed needle felter and a lover of the weird and wonderful. Service providers. I engage certain trusted third parties to perform functions and provide services to my shop, such as delivery companies (eg. Royal Mail). I will share your personal information with these third parties, but only to the extent necessary to perform these services. Rebecca Kemp, 2 Vine Cottages, North Street, Theale, Berkshire, RG7 5EY, United Kingdom. All custom and personalised orders are individual to each customer's request and will be discussed in detail through Etsy messaging or by email. Costs and timings may vary, but will be discussed and explained thoroughly. To care for your needle felted pieces, do not rub the surface of the piece as this will result in bobbling. Dust lightly, and if needed delicately dab with cold tap water and leave to air dry. You can also slightly trim any loose fibres if bobbling does occure.